A Blog Of Ice Cream: Ice Cream Cones By Post! Ice Cream Cones By Post! Ice cream cones are great fun - especially when they come through the post on your birthday! That's what happened to me .... it looked like an ordinary envelope but when I opened it I found it was no ordinary birthday card. Three beautiful paper ice cream cones (1 large and 2 small) stared at me from the front of the card. What a lovely idea! Without thinking, I placed the card down next to my ice cream maker (I was in the kitchen opening the post at the time). Then it occurred to me what a super image I beheld ..... sitting atop of my ice cream maker were 3 hand-knitted, wool ice cream cones - a gift from my cousin Iris some years ago (Iris is a wonder at knitting!). 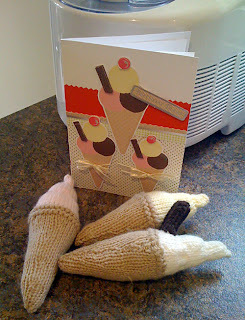 The ice cream maker, the 3 knitted cones and the ice cream cones birthday card all together. I grabbed my iPhone and took a picture. That's what I call an ice cream themed birthday! Thank you Brian and Pam for sending me such wonderful ice cream cones through the post!. Ice Cream & Sloe Gin - What A Mess! French Ice Cream Cones - Mansize! Multifunctional Ice Cream - A Recipe For Success? Ice Cream Sundae - Google Doodle Honor!